It was going to be the perfect date, a gorgeous Sonoma County wine country day. All around us the sun glowed, nothing but blue skies did we see. Ahead was the promise of superb wine, a cave exploration, and a Lake Sonoma visit. I had planned this date with my husband, and it was going to be fabulous! We began our trip in Duncans Mills, winding our way east through the Russian River Valley vineyards of Westside Road. 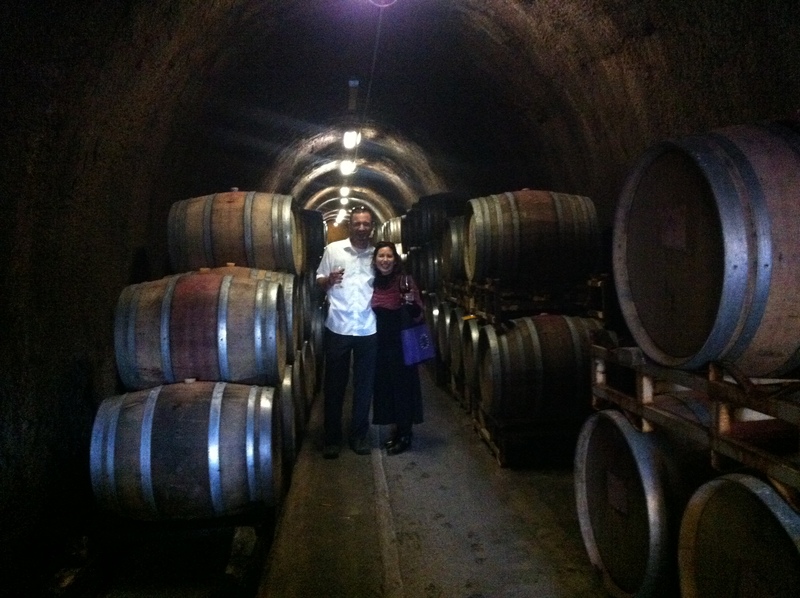 Our destination was Fritz Underground Winery, nestled in northeast in Dry Creek Valley. A picnic basket was packed with brie, apples, dried fruit, salami, nuts, bread, and chocolate—all we needed now was the wine. The hills shone like emeralds; the flowers bloomed in every color; the birds cavorted and flirted with each other. Soon we would enter a wine cave, sample hand-crafted delicious award-winning wines, and eat our picnic. I was especially looking forward to tasting the wines created by winemaker Brad Langton, who has won many gold medals for his alchemy. I could hardly wait! When we arrived, I knew my perfect date plans were working. Built into the side of a hill, the winery itself is picturesque. With the the view of vineyards, sloping hills, and a natural spring, I almost felt as I had been transported to Italy. Upon entered the wine tasting room, we immediately enjoyed the relaxed, inviting atmosphere. Our wine tasting began with the 2013 Estate Sauvignon Blanc, rated 92 points. This gold medal winner offered aromas of white peach and orange blossoms. Next came the Russian River 2012 Pinot Noir, a double gold medal winner that tasted of black cherries and pomegranate. All the grapes for Fritz’s wines are grown in Sonoma County, mostly from the winery’s 112 acre estate. For Chardonnay and Pinot Noir, the grapes primarily come from the Russian River and Dry Creek Valleys. One of my favorites was the 2010 Reserve Zinfandel, created from 30-year-old vines. The flavors of red cherry, black currant, and cocoa swirling in my mouth was delightful. One of the oldest wineries in Dry Creek Valley, Fritz Underground Winery was also one of the first to be energy-efficient. In 1979 founder Jay Fritz had the foresight to utilize gravity as well as the cool temperatures created by a wine cave. The gravity-flow production system is constructed on three levels. The crush pad is situated on the roof, and the fermentation tanks are below ground. When the juice is ready, it is sent from the tanks to the second underground tier (the cave) for barrel aging. This process allows the winery to handle the grapes as little as possible, allowing for natural flavors. The winery maintains it is this use of natural elements and forces that keeps the delicate nuances of their terroir present in their Pinot Noir and other prized estate fruit. Now it was time for a tour to see the winemaking process for ourselves. As we stepped into the cave, I couldn’t help but think, just how primordial is it to enter a cave? From the beginning of time, the cave has set the scene for our self-discovery, the subconscious, or just plain protection. The smell of wine and oak mingled as we passed the wine-stained barrels, our voices echoing off the rough–hewn walls, our shadows stretching. As we went further into the wine cave, the temperature became decidedly chilly. We learned from our guide that the cave allows them to utilize the naturally even, cool underground temperature for optimal processing and barrel aging of the wines. The use of gravity instead of pumps also enables the winery to save electricity. A natural spring supplies simple irrigation. Afterwards, we took our wine and lingered over our picnic, soaking up the views of the spring and oak-studded hills. When it was time to go, we drove to our last destination, Lake Sonoma. After only about five minutes, we arrived at a picnic table overlooking the lake. The sunset had just begun. It was that golden hour when everything seems illuminated from the inside out. The birds were still serenading each other; the flowers continued showing off their colors. My husband and I held hands, watched the sun slip down behind the mountains and shimmering lake, and I gave a deep satisfied sigh. It had been the perfect date. 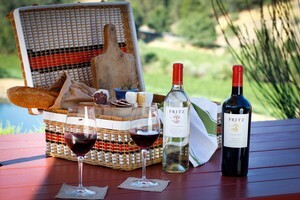 For more information about Fritz Underground Winery, visit http://www.fritzwinery.com or contact them at (707) 894-3389. Be sure to check out their newly remodeled wine tasting room, particularly the bar topped with white-washed elm. The winery is located at 24691 Dutcher Creek Road, Cloverdale.